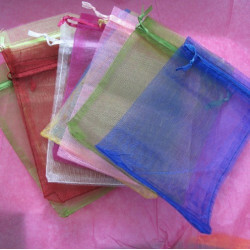 Organza bags There are 7 products. 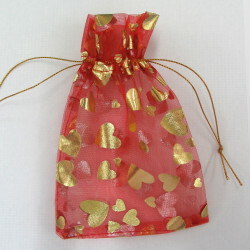 Red and gold organza bag. Pack of 5. Approx 4 x 6 inches, 10 x 15mm. BG0002 - Pack of 10 Organza bags.. 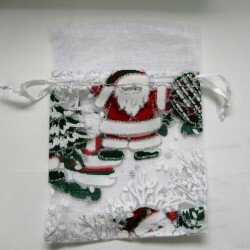 Size approx 15 x 10cm. Colour selection may vary. great value! 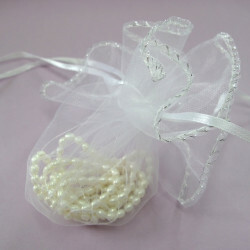 Organza bag, white, pack of 5. 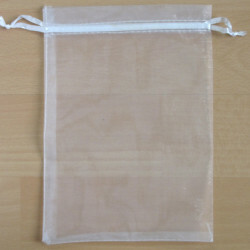 Organza Bag, White, Approx. 185mm by 130mm, Pack of 5. 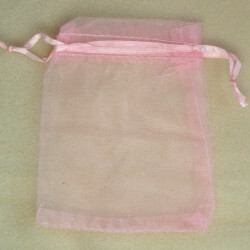 Organza Bag, pink. 120 x 100mm. Pack of 5. Click view for quantity discount. BG1036 - Fancy White Organza Bag. Pack of 5. These are so pretty. They come as a round disc of organza approx 25mm diameter. When the drawstrings pulled they become much smaller, with room for a small gift. 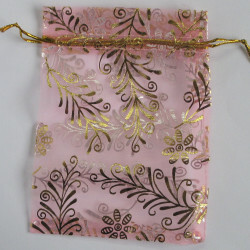 Organza Bag, Pink, Embossed with a Gold Coloured Floral Design, Approx. 140mm by 100mm, Pack of 5.